As we've established, Goosebumps is a long running series of books dating back to the 90s. But Goosebumps is so much more than books. It's TV shows, board games, movies, and yes, video games. 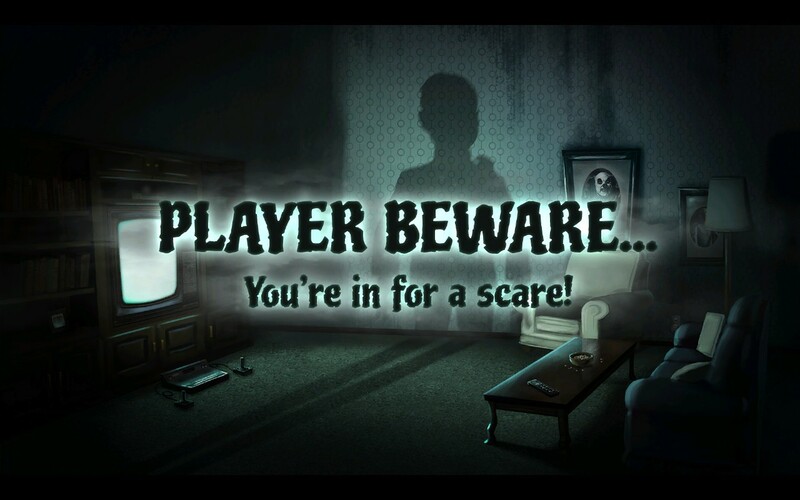 There have been several video games over the years, and though some came out when I was a kid and still reading the series, this is the first Goosebumps video game I've played. It came out the year of the Goosebumps movie starring Jack Black, but it's not based on the Movie. Not really anyway, though there are similarities. I suppose it could be a prequel? I am not positive if that was the intention or not. Like the movie, this game involves author RL Stine moving to a town and his literary creations escaping their book and causing problems. No Jack Black in this game though! 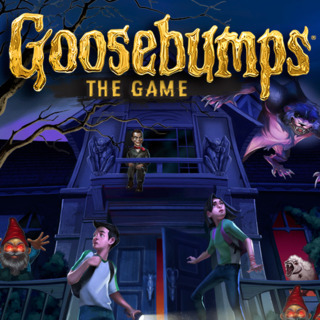 So what kind of game is Goosebumps? 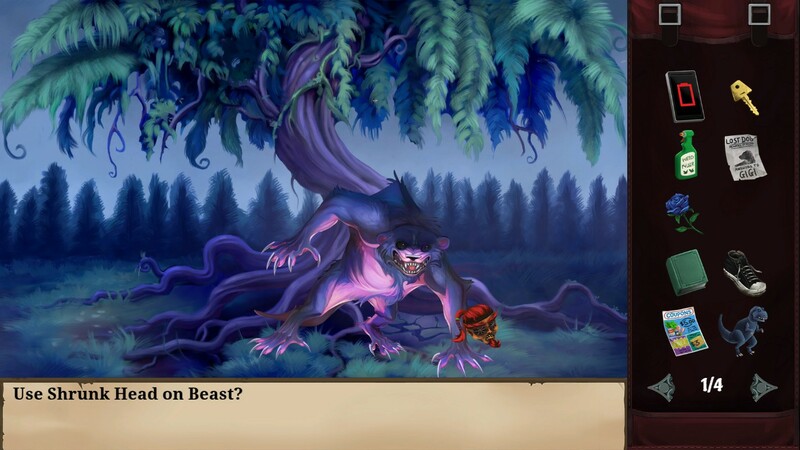 Why it is a point and click adventure just like free Ye Olden Times. Back in the days of King's Quest and Monkey Island. Unlike those games, however, there is no avatar. You are, well, you. The jr. high version of you that is. There is no character for you to identify with, so hopefully you can identify with yourself. In this sense it makes it feel like the "Give Yourself Goosebumps" series. And it's like that in more ways than one. Stupid untimely deaths lurk right around the corner! Anyway, unlock the coverage I do for the books, I'm not going to vomit back the plot at you. But I will talk about things a bit. So you begin at school, with an empty inventory and a handy dandy cell phone. It's up to you to collect items and figure out how to use them to get through various puzzles and fend off various creatures. And there are A LOT of items. There are a lot that reference Goosebumps but there is also a lot that is just... well... Junk. There are alternate ways to solve many puzzles but I am not convinced every item you can pick up serves that purpose. For example, you find a screwdriver which I probably used a half a dozen times. I also found a half a dozen shoes (no joke) that I used 0 times. Luckily not all the items are so boring. 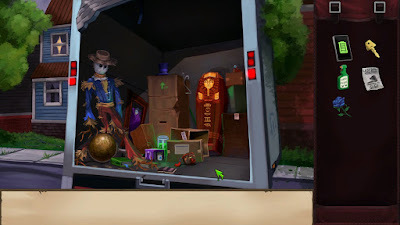 Early on you find a crashed truck full of Goosebumps related items. Why, whoever could have been moving? Oh right, I already told you, it's RL Stine. So anyway, when you get home from school you discover that something has happened to your house. It has turned all spooooooooky. Not only does it look like the Adams Family lives there, but there are genuine ghosts inside. The ghosts of children for that matter. Which... now that I think about it is a real bummer. You know it didn't hit me as I was playing the game... there are 3 dead children inside your house. How did they die? So young? Jesus. That's harsh game. Harsh. As far as the puzzles go, most are relatively easy. Which is as it should be, it's aimed at kids primarily I imagine. Though if you are like me, and reliving some nostalgia I think you'll still have some fun. It's not like, baby easy. And there were a few things that were actually kind of frustrating. For example, you can use your cell phone to call your mom, but your battery wears out. My battery ran dead but there was a puzzle I thought needed my sell phone. I was racking my brain trying to figure out how to charge my phone. It insinuates you can, and indeed it is possible... but only later on. If you are like me and kill your battery there is a entirely different way to do the same puzzle. Which is nice, but when your mind knows how to do it, but can't, it's a little frustrating. Also, there is one puzzle where you have to develop pictures. The process takes 1 minute for each of 3 steps. So, 3 minutes total. And what do you do with those 3 minutes? Wait. Literally. It makes you wait a minute each time. Almost exactly a minute too. If you try to click too early the picture doesn't develop. If you wait too long it overdevelops. So you have to try again, and wait more minutes. Not hard, just... frustrating. The last step takes 5 minutes but thank the lord it doesn't actually make you wait. It just says you wait, which is honestly what I think it should have done all along. 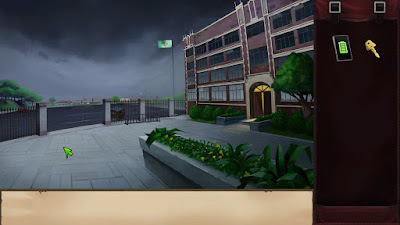 So I'm posting some screenshots so you can see that the graphics are pretty good. There is not a whole lot of animation, but everything has a kinda cartoony but still eerie look that reminds me of various book covers. Since the monsters are ones escaped fro the books there are plenty you should be able to recognize. There are plenty of old fan favorites, but some newer ones too. There were a few I didn't recognize but I bet if I asked my niece who reads the newer ones she'd probably know em. Playing it on a platform with achievements is fun, there are plenty to get, and a lot that have some humor. For example, I played this on Steam and I got an achievement for doing my laundry. As far as I could tell there was no in game need to do it, so I got rewarded for doing my chores. Hurray! Plus since there are alternate ways to do things, you could probably play through it a couple times and still have fun while racking up new achievements. Now the game costs 19.99 on steam. I beat it in about 4 hours (not trying hard to be speedy) but like I said, there is replay value. I haven't done so yet, but probably will. If you're looking to play it on PC and pick it up on steam you could probably wait for a sale and get it far cheaper. I paid about 5 bucks to get it in a bundle for other games, and it was well worth the money to get some nostalgia. It was a new experience, born out of old experiences. 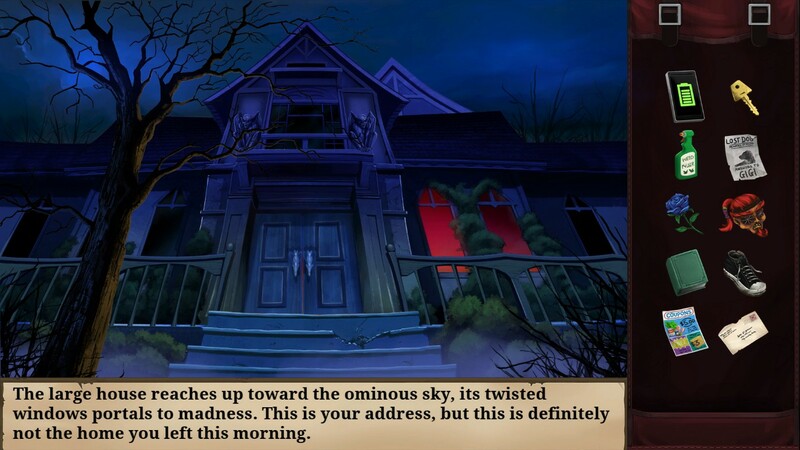 While it doesn't reinvent the genre, and I wouldn't call it the best point and click adventure ever. But it is a pretty good introduction to the style of game for younger players and fans of the books. I hope they make a sequel. I could see a Horror Land themed game like this being great. Who knows, of all the Goosebumps games that exist maybe there already is one I am an aware of. So if you are curious and see it on sale, I say give it a go. One of the books I hope! Seriously though, I'm planning to read one of the Goosebumps 2000 series ones really soon. just gotta motivate myself. Anyway, thanks for reading and catch you next time.